I’m driving from Flintshire to Edinburgh to see a play. It’s a bit of a way to go just for a play, so I figured that I should turn the trip into a long weekend away with a likeminded soul. 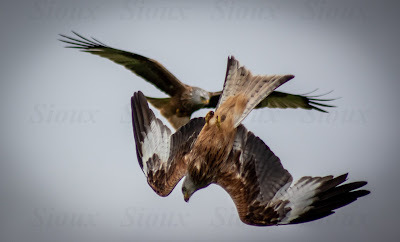 My friend Nikki is a theatre fan, a great photographer and interested in ornithology, so we got our heads together and booked tickets for the last night of Creditors by August Strindberg at The Lyceum Theatre. 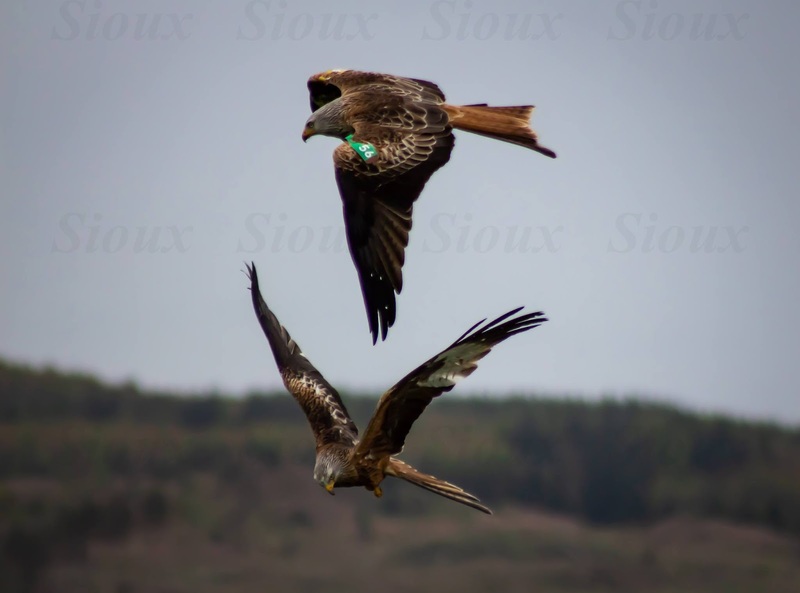 Nine months lay ahead to decide and plan where we were going with our cameras! “How about lunch at The Witchery on Saturday?” “Oh my God woman, you’re on fire! 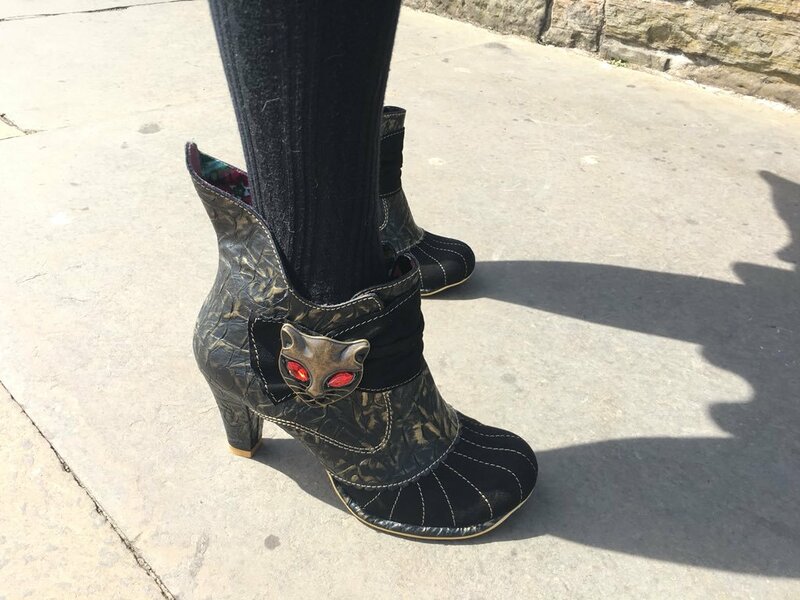 That sounds amazing – just my kind of place…and I can wear my cat boots. Very witch like!! !” “Have you any ideas what you want to do, I feel like I’m hijacking the holiday?” “Nope, it’s all sounding perfect but I’ll get my thinking cap on.” I didn’t. The only effort I can honestly say I put in was buying lots of gluten free goodies and Prosecco…but every girl needs Prosecco, right?! After a long cross country drive we arrived in Wigtown on a grey and gloomy morning. We headed towards our first bookshop and were approached by a chap carrying sound recording equipment. Turns out he was from Radio 4 and needed an audience in the book shop. It didn’t seem an onerous task so we went in. A band (made up of one male and one female) were playing songs about books, they were brilliant and it was easy to get involved with cheering and clapping for the radio listeners…however, what we were not prepared for was to be interviewed afterwards. Harvard University president Charles W. Eliot, had stated that all the elements of an education could be obtained by reading from a collection of books that could fit on a five-foot shelf. The question was set, what books would we put on the bookshelf? 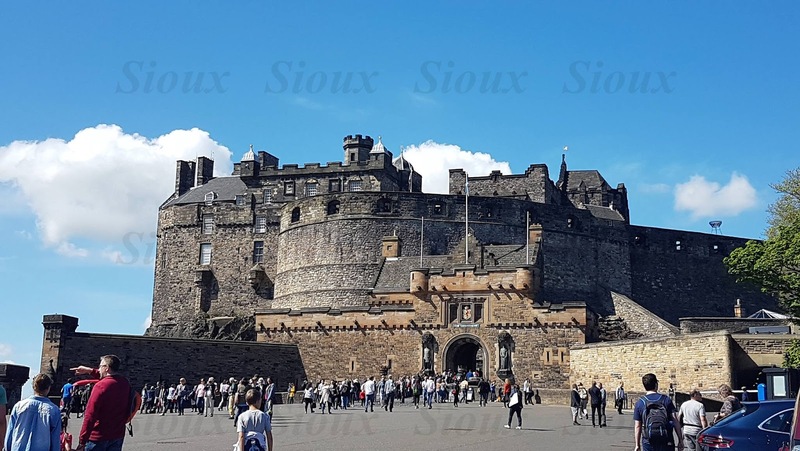 As Nikki and I headed off for lunch (Cauliflower Cheese soup – it sounds disgusting and we told the waitress so, only we found out it’s quite a taste sensation and we wanted the recipe) we laughed at how the morning had panned out. I love nature and the opportunity to shoot raptors on the wing (with a camera!) was just too appealing. 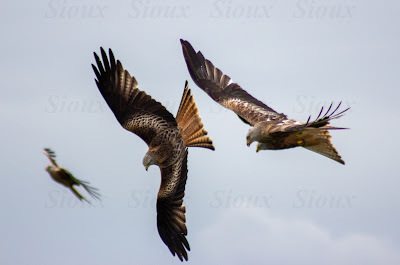 I dug out my Cannon EOS 700D and mourned the loss of my my favourite 500mm "wildlife" lens which somehow had grown fungus inside it (don’t ask) so I was reduced to a 300mm lens for trying to get some shots of the kites with. I didn’t think I would get any decent shots at all. I thought if I was lucky I might get the odd blurred shot of a bird, or more probably a load of indistinct tail shots; however, when I was finally brave enough to look at the results on my computer, I was pleased to see that there were a number of shots to be proud of, especially as I'm more familiar with taking still shots. I’m not going to become Chris Packham overnight, but I thought for a first attempt I had something positive to work with and improve upon! When we arrived at Bellymack Hill Farm, it was feeding time. We’d just missed the start due to our inability to negotiate either road signs or the ubiquitous SatNav that sends you where it wants to go and not where you think you’ve programmed it to go. 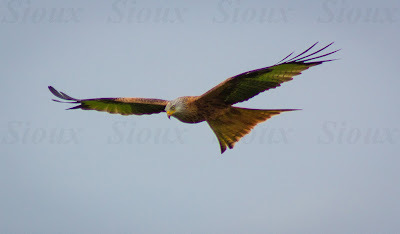 As we raced to the back of the car to grab our camera’s, the air above was dark with the wingspans of dozens of Kites circling around. We raced to the viewing platform, throwing admission money at a bemused lady behind the counter on the way, and grabbed a spot to watch these majestic creatures in action. Red Kites have faced persecution in the UK, nearly dying out, but they have successfully been re-introduced back into parts of Scotland, England and Wales and they are now thriving. 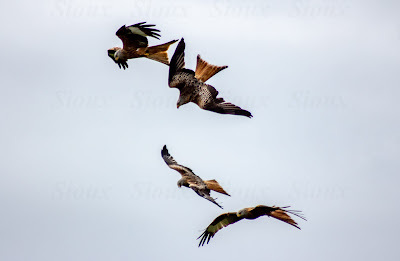 The Kites at Galloway were reintroduced back in 2001, and it was a joy to watch these gregarious birds swoop down, talons outstretched to grab meat from a large platform, and rise on the updrafts for others to take their turn. 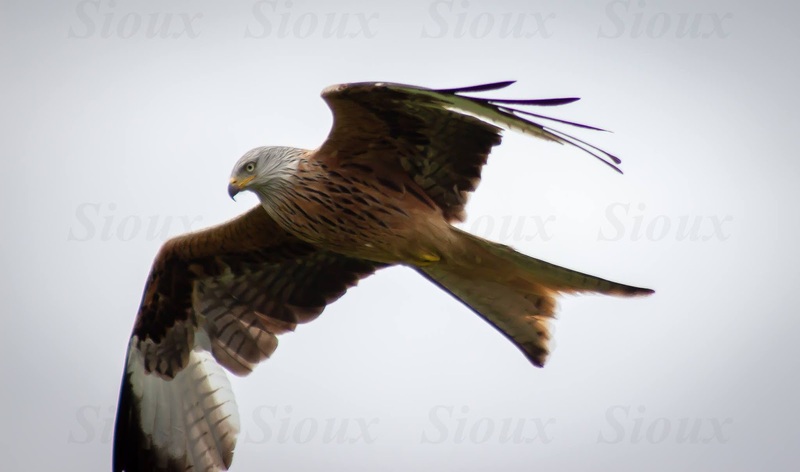 Whilst it could be argued that this isn’t really watching the birds in their natural environment, it does give you an opportunity to get up close and see how beautiful these extraordinary creatures are. The day we’ve been waiting nine months for! The sun was beating down; I was carrying a leather jacket and starting to wish I’d left it at home, the shops were calling and a castle needed visiting. So of course we headed off for Lunch at The Witchery. Let’s be honest, you can’t do anything on an empty stomach. 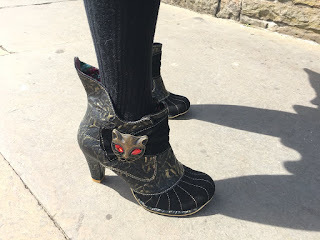 I wore my Gothic-esque cat boots as I thought they would be rather fitting, and I sat in amazement soaking in the gorgeous dark wooden interior of the restaurant. The waiters were welcoming and made the experience incredibly relaxed and the food was sensational. Nothing was too much trouble, even when there was a Pescatarian and a Gluten Free diet to take care of! I heartily recommend anyone visiting Edinburgh to book a table there. OK, it’s a little bit pricey, but it’s a Michelin starred restaurant and well worth every penny for the full dining experience. 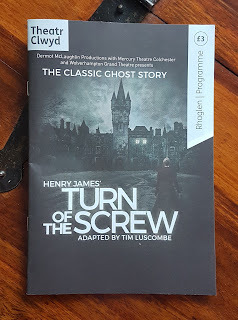 This play was drawn to my attention because in 2009, Tom Burke won the prestigious Ian Charleson award for his performance as Adolf in a production directed by Alan Rickman. Not only did it feature Tom in the cast, but another favourite of mine, Owen Teale and the utterly brilliant Anna Chancellor. It has always been a regret that I didn’t get to see that particular production, so I was thrilled to be able to watch it this time around. Free-thinking women are a danger to society and it is best to show who is in control from the start. Of course, Gustav’s views are not because he has a vested interest in his ex-wife, but just a reasonable viewpoint that men should consider for the benefit of all society. 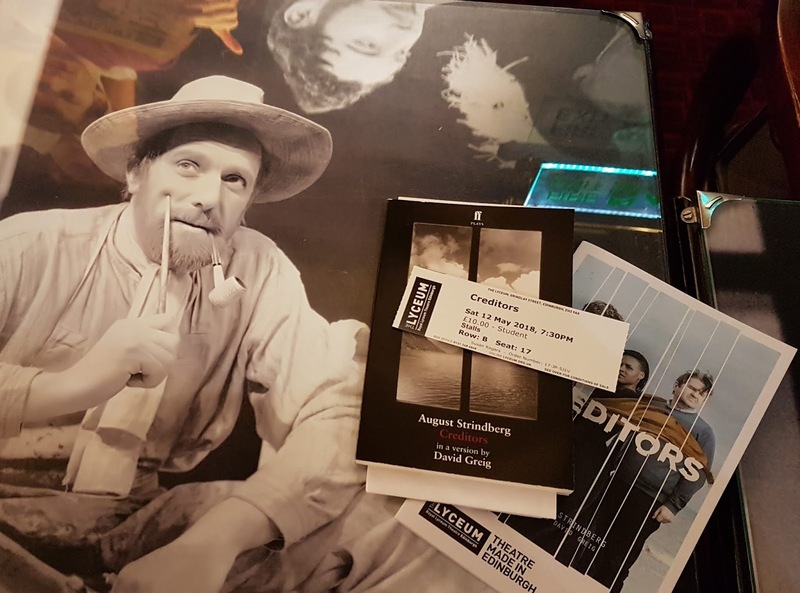 Strindberg’s play is a raw and brutal look at the ease in which someone can be manipulated into questioning both themselves and those that surround them. Tekla, and her younger second husband Adolf are on holiday at a seaside resort, when Tekla spends a day away from Adolf he is befriended by a stranger, Gustav. Adolf is both full of youth and optimism, but prone to moments of dark thought and his ease at offloading his worries to this stranger makes it easier for Gustav to manipulate and impress on Adolf that his fears are not unwarranted. It is only as the play unfolds that we see Gustav has more at stake than just giving friendly advice to Adolf. 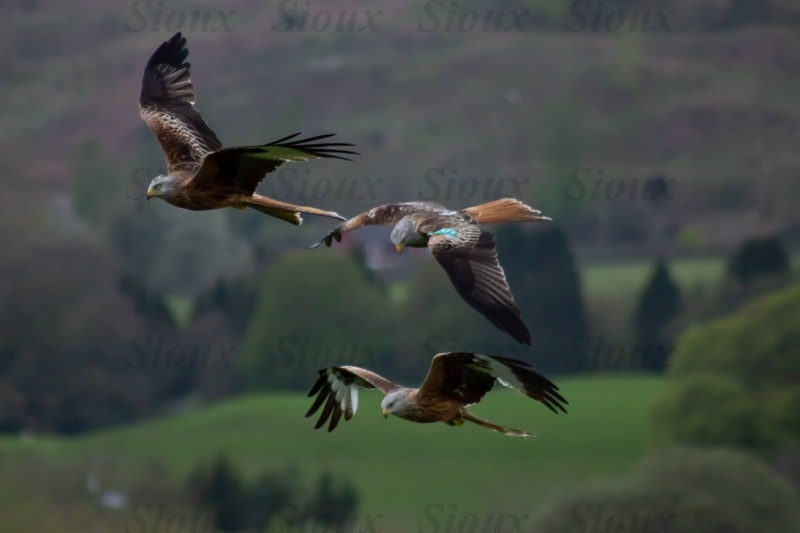 This was a superb production by Stewart Laing. 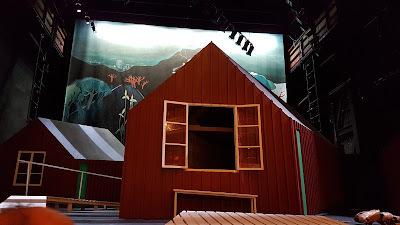 I particularly liked the scene breaks where by a group of silent Girl Guides robotically march on stage making fires, waving flags in semaphore, symbolically communicating with the audience in a strange but almost comforting manner which helps set the finally emotionally charged ending. The eerie music and the use of black and white live recording from inside Tekla’s beach home adds to the dramatic climax, as we bear witness to the relationship of all three parties, but from a distance, as we watch it played out on film. 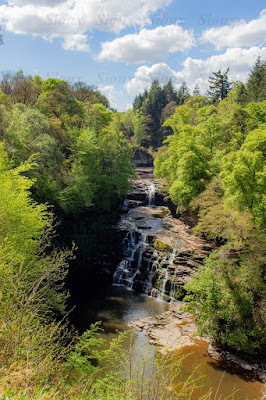 The final full day had us heading not far from our holiday home to the Falls of Clyde. 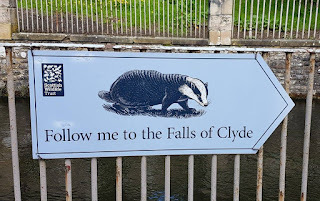 Whilst there were various routes you could take, we decided on simply “following the badger signs” on a short walk along the River Clyde from the World Heritage Site which passes a series of waterfalls through a beautiful woodland setting. 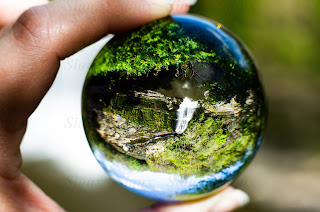 We returned the way we came, however, if you have the time and energy, the walk can be extended by returning via the opposite side of the river in a more circuitous ramble. 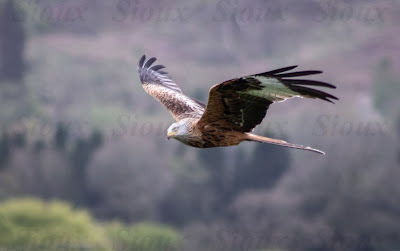 The reserve is home to over 100 species of birds, including kingfishers, yellowhammers, spotted flycatchers and ravens. 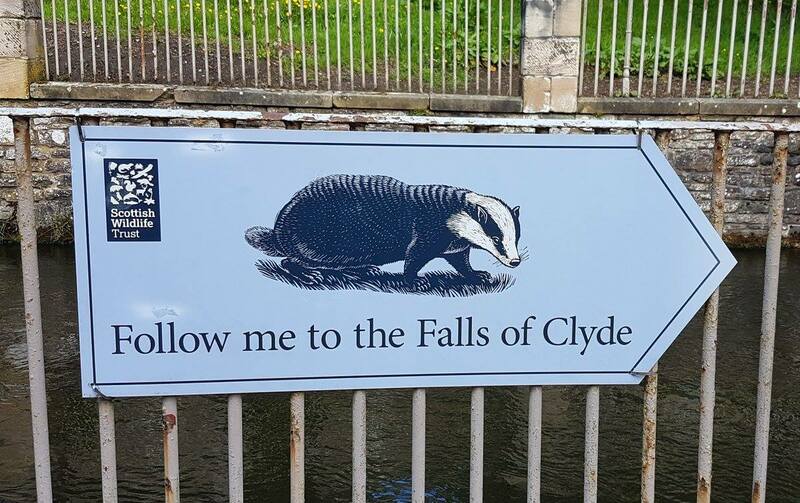 In the evenings Daubenton’s bats swoop over the river to catch their supper, whilst otters play along the riverbanks and badgers start foraging in the undergrowth for juicy earthworms and other tasty treats. 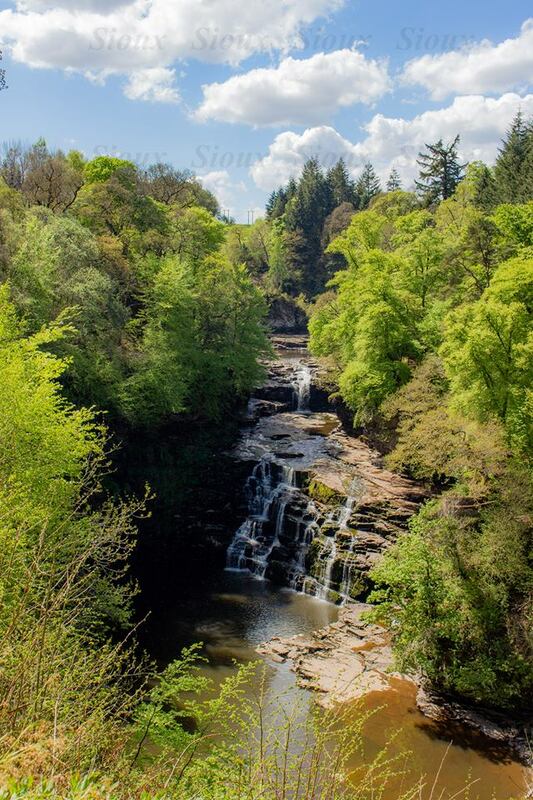 If the wildlife isn’t playing, there are still the scenic woodland walks, carpeted with bluebells in the spring, and if it’s been raining, spectacular waterfalls to view en route, including the impressive Corra Linn, standing at 80ft high. 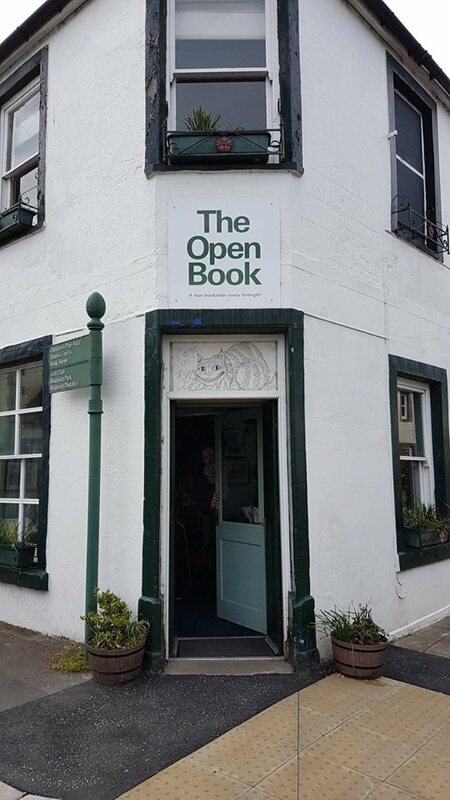 After a day out rambling, ensure you leave enough time to pop into the visitor centre for some locally inspired crafts in the gift shop and a tasty ice-cream. I heartily recommend the Irn-Bru ice-cream as a break from the normal vanilla! The Turn of The Screw (Theatr Clwyd) - and a Brilliant Bank Holiday! A Bank Holiday filled with sunshine! Well that’s a first! Despite “Derek The Weatherman” promising a nice break I didn’t believe him, so I was caught somewhat by surprise. I thought I’d enjoy some R and R in the garden before realising that a) the garden didn’t exist – instead a patch of overgrown wasteland had been deposited outside my back door, and b) the garden parasol had been left out all winter, the wooden pole had rotted through, and the remains of spiders, flies and god knows what showered on my head as I tried to open it up. Having lost the cat in foot long grass, which I swear at one time had served as a lawn, the restful weekend turned into locating a machete and making the place look like it’s inhabited. Radio 4 has turned into my Godsend these last few days, there were several plays I popped on as I set to work in the blistering heat. The ground has been cleared of weeds, not sure the frog was too happy about that, but I found room to leave him and the local hedgehog a large shallow dish of water in a shady spot near the back of the shed, so I suspect I’ll be forgiven. The patio has been cleared of weeds and jet washed and is now ready for the summer pots to be planted up…although they’re in the greenhouse and that seems to have become a dumping ground for all the rubbish I brought back with me when I vacated my allotment. That’ll be the next Bank Holiday’s job then! So after all that hard work, I felt I had earned a new patio brolly, so having bought some tropical parrot cushions for the chairs, it seemed a subtle lime green parasol was the way to go! So, just as the Bank Holiday is waving goodbye, and work come beckoning, I’m ready to sit in the garden with a G&T Popsicle and start writing about what I’ve been up to regarding theatre land. The classic ghost story brought to life by Daniel Buckroyd, tells the tale of a governess in 1840 who agrees to look after two orphaned children. Shortly after arriving at the country house in Bly, the governess sees the image of a man and a woman who she later finds out are former employees at Bly, now deceased. The governess feels compelled to do everything she can to keep the children in her care safe, but at what cost? Why I am drawn to ghost stories is anyone’s guess, but they are an intrinsic part of our literary heritage. From Hamlet to Jane Eyre; Green Tea to The Woman in White, the UK is richly furnished with tales of ghostly goings on. There is something strangely comforting about sitting in a darkened theatre having the wits scared from you, to breathing a sigh of relief when the lights come on and we are back in the normal world.< The Turn of the Screw is a disturbing tale and ambiguous in that one cannot be sure whether the ghosts are real or not. The tale has inspired many writers including Susan Hill – the image of a woman in black and a chair that rocks on its own – are both elements borrowed for her own famous tale, The Woman in Black. Skewed proscenium arches framing the stage, dustsheets covering items of furniture, subtle lighting where gaslights flicker, silhouettes appear behind frosted windows, lightning flashes giving a glimpse of bodies, together with an evocative music score, the eerie stage is set! 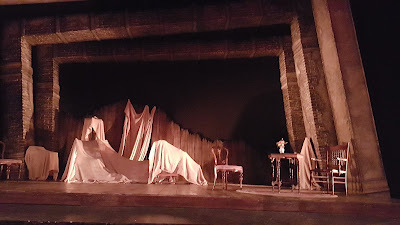 What I really loved about this version was that whilst it stuck pretty close to the original book, I left the theatre pondering what had really happened. Tim Luscombe’s adaptation picks apart all the contradictions in James’ book, giving a layered production which takes the now grown up orphan Flora (played by Annabel Smith as both the adult and child) to question the governess about what had happened to her and her brother during her childhood years. I had taken the book at face value, just a ghostly tale, had the governess seen the ghosts or were they just a figment of her imagination? Admittedly I had read the book quickly, but I hadn’t really given any thought as to the actual state of mind of the governess. Was this the mind-set of a sexually repressed governess, or a woman suffering from depression, or was some deeper Freudian thinking necessary? Carli Norris’ knock out performance changed my thoughts on the book and gave me some deeper, complex, food for thought. I drove home seriously questioning those ghosts, were they real or not?! I think another, considered, reading of the text is probably in order! 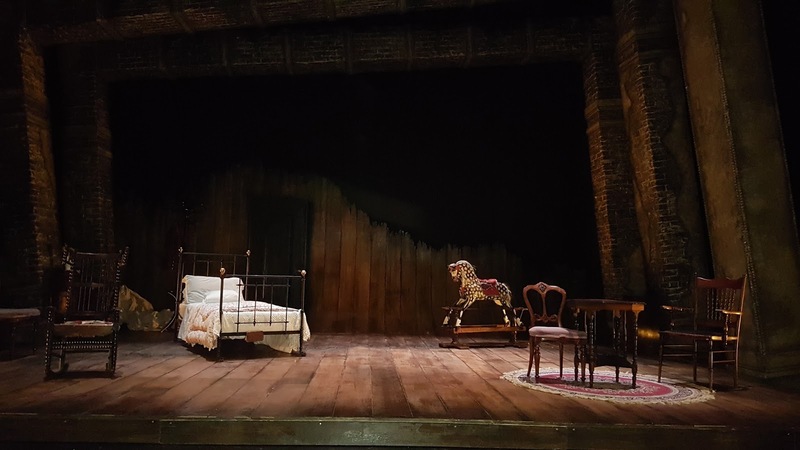 The play is still touring until 26th May 2018, catch it if you can.